A native of Sydney, Australia, James Churchill has recently completed an Artist Diploma at the Glenn Gould School. In 2017, Mr. Churchill joined the Canadian Opera Company as an Academy Fellow for their production of Götterdämmerung. Mr. Churchill recently joined the Australian Ballet in their productions of Swan Lake and Romeo and Juliet, In addition to regular engagements with Orchestra Victoria and The Melbourne Symphony Orchestra. A passionate chamber musician, Mr Churchill has spent summers at le Domaine Forget. As cellist of the Zené quartet, has been a prizewinner in The Glenn Gould School’s Chamber Music Competition. He has joined the ARC ensemble in performance at the Royal Conservatory. Mr. Churchill regularly coaches ensembles of the Royal Conservatory School and the Taylor Academy. Mr. Churchill studied at the Australian National Academy of Music, the Yong Siew Toh Conservatory, and the Glenn Gould School. His primary teachers have been Desmond Hoebig, Andrés Díaz, Li-Wei Qin, and Howard Penny. 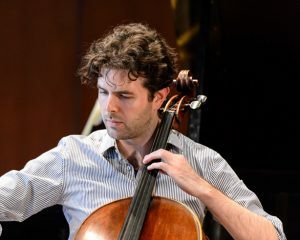 He has performed in masterclasses for such artists as Colin Carr, Clive Greensmith, Michel Strauss, Ralph Kirshbaum, Steven Isserlis and Pieter Wispelwey. In September 2018 he will begin a fellowship at the New World Symphony in Miami.